On Saturday, I walked with dozens of other people at the Walk to End Alzheimer’s at the Mauch Chunk Lake. The turnout was pretty good for a damp and cool day. As I walked to a turning point in the route, I noticed a white crane across the cove off the breast of the dam. Its bright white feathers stood out against a misty and foggy backdrop. I pointed the crane out to the couple I was walking with and we stopped for a few seconds just to enjoy the view. Others on the walk probably weren’t even aware that the majestic-looking bird was so close. 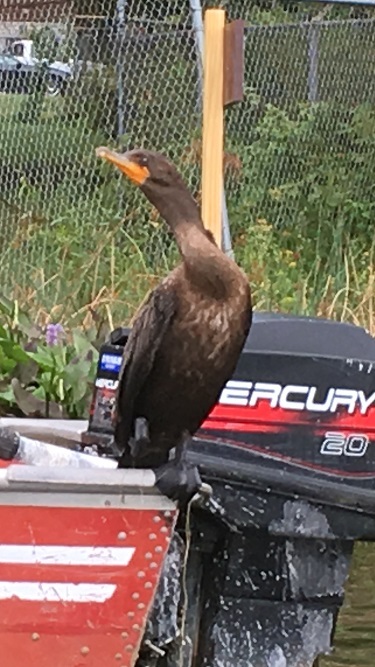 As we continued on the route, an unusual, big duck with an orange beak and black webbed feet was hanging out on the end of one of the docks. 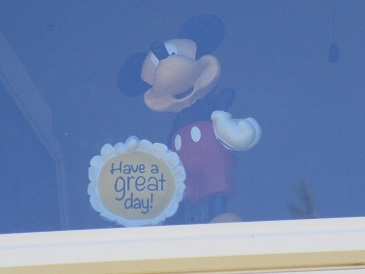 I wanted to put a smile on others’ faces recently when I put this Mickey Mouse ornament I won at a basket raffle in my soon-to-be office window, facing directly onto the canal. If anyone passing by looked at my house, they would get a bright message. I wonder how many people are aware it’s there. Next time you walk by, take a look. Like the birds and animals around the lake know, being aware of your surroundings can mean the difference between life and death. It’s sad so many walkers missed the beauty of what I saw Saturday morning, but it’s even scarier of what that lack of awareness could mean in a world where terrorism has become so prevalent. When I’m out in nature, I’m very aware, but when I’m grocery shopping or elsewhere, I’m not. Like many other people, I’m just focused on what I’m doing with a tunnel-like vision. I ask myself, ‘How can I be more aware?’ After a few minutes of pondering, the answer is clear: The only way to be aware is to live fully in the present moment, taking in all my surroundings with all my senses and intuitions. How about you? Are you aware?